Creating the perfect set of acrylics could be considered an art, but the foundation behind it — and the answers to many common technical questions — is found in the science. As a tech, it’s good to stay knowledgeable about ingredients so you can keep clients informed on how things work and what chemicals are used. 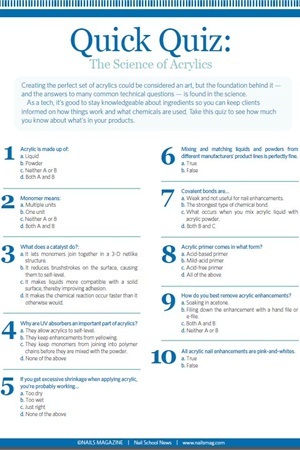 Give your students this quiz to see how much they know about what’s in nail products.